Whether it's 12pm or 12am, it's always cocktail o'clock. 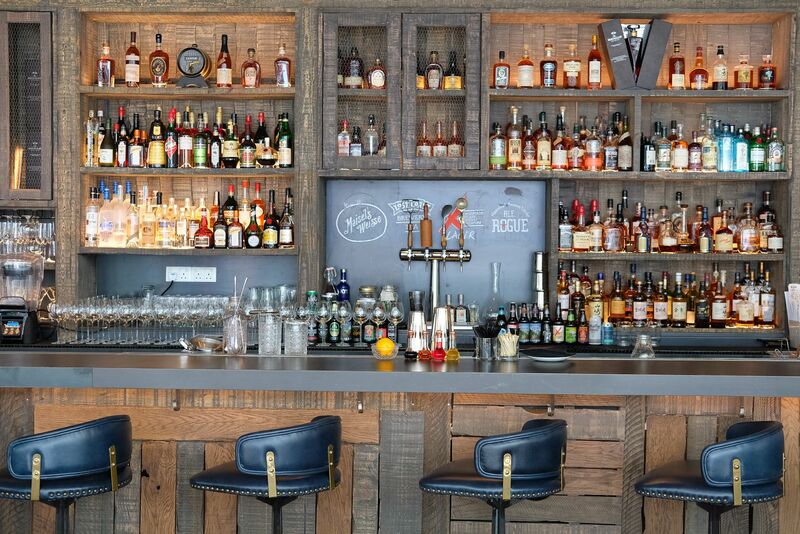 With an impressive selection of spirits, and bourbon of course, The Bird aims to dazzle diners with handcrafted cocktails such as the signature Blackberry Bourbon Lemonade($27) and Old Fashioned with Bacon Infused Bourbon($27). 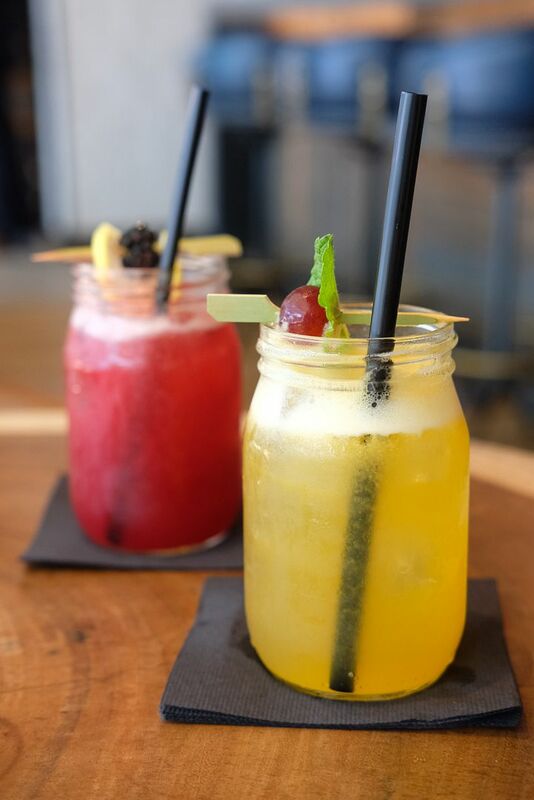 Unique concoctions with an Asian touch includes The Ong Bak, The Japanese Porkchop(Yamazaki 12 years, dijon mustard, unfiltered apple cider, Marugoto Shibori Yuzu and fresh thyme), and more. If you like passionfruit, like me, go for the Southern Revival ($22)! The Fried Green Tomato BLT ($18/a la carte) is an interesting and very different take on our usual BLT, which we usually get in the form of a sandwich. 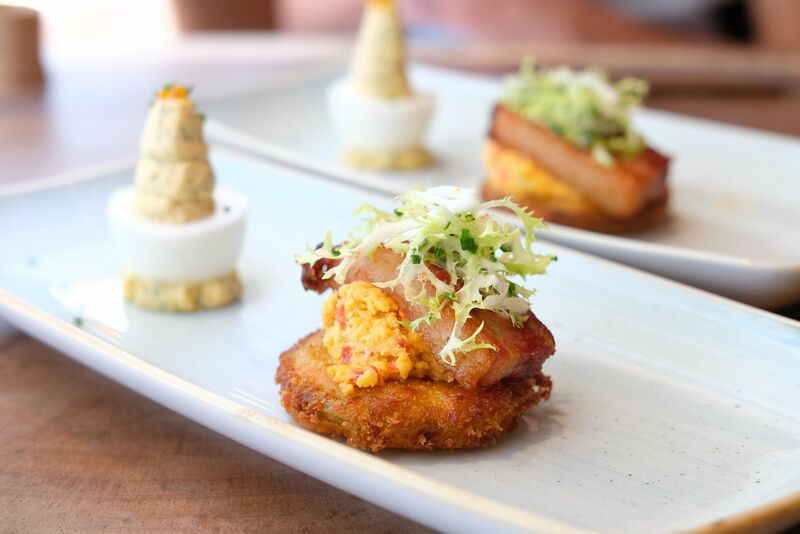 An ensemble of tasty house-smoked pork belly, a dollop of pimento cheese, some smoky tomato jam, a small piece of frisee and pickled lemon vinaigrette, sits pretty on a slice of fried green tomato. The highlight for me was undoubtedly, the pork belly! Next to the BLT lies a simple deviled egg whipped up with dill, chives and topped with smoked trout roe. Simple, but yummy! 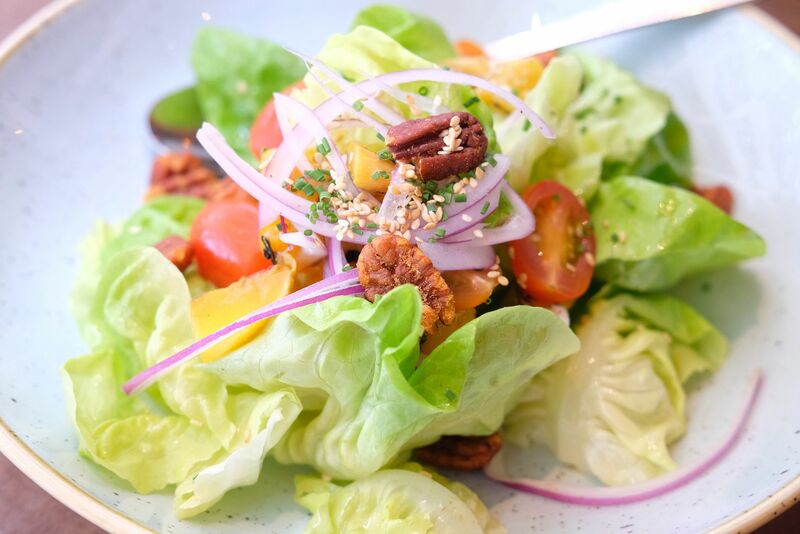 Perfect for those who crave a light lunch, or a refreshing salad, the Butter Lettuce & Grilled Mango Salad ($18/a la carte) features a mix of fresh butter lettuce, red onion, and tomato, dressed in a benne seed vinaigrette. The salad is then generously topped with the sweetest char-grilled mango pieces and really delicious smoked pecans. 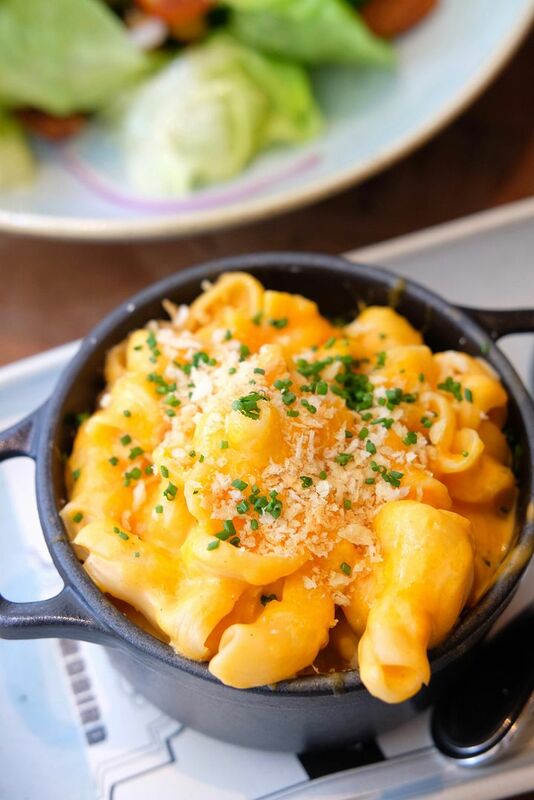 Crafted with 5 different types of artisanal cheeses, the Macaroni & Cheese ($14) is absolutely not for the faint-hearted. Cheese lovers will revel in the richness of the dish, and might even fall in love with the creaminess and texture of the torchio pasta. However, for someone who doesn't like cheese, like me, this is too much. Even so, I did enjoy the first few mouthfuls too! It just got too rich and too heavy for me after awhile. 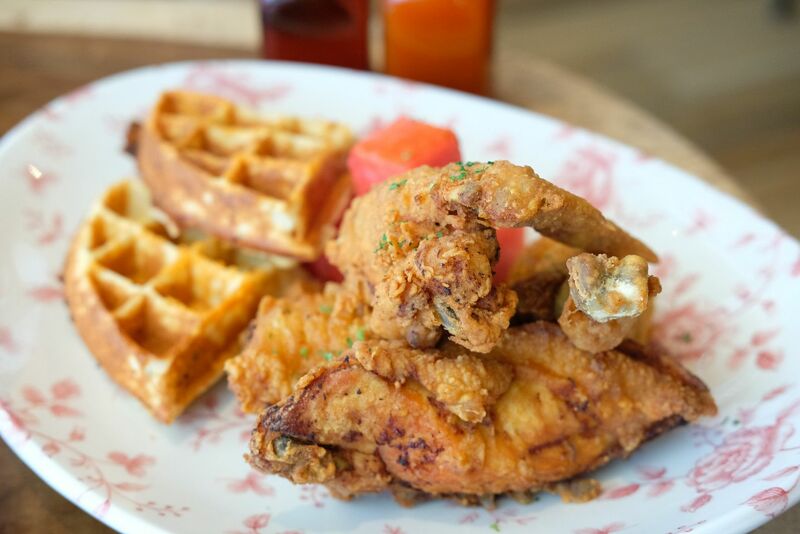 Everyone knows that The Bird is famous for their 100-year-old recipe Lewellyn's Fine Fried Chicken ($45/a la carte). I first had a taste of it at Epicurean Market at Marina Bay Sands last year, and I haven't stopped thinking about it since. 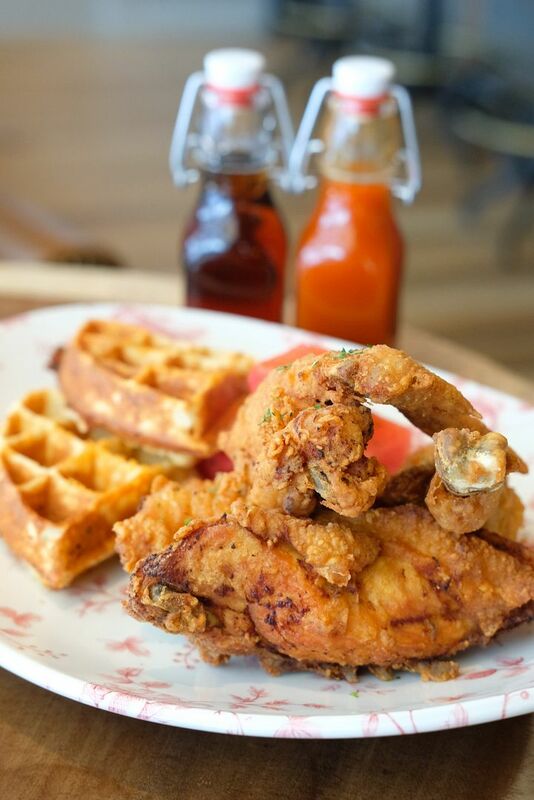 I couldn't wait for The Bird to finally open so I can get my hands on some legit chicken and waffles! The chicken here is brined for 27 hours, before it is expertly fried. Diners can look forward to half a juicy and tender chicken. Even the chicken breast wasn't tough or dry, like I had expected it to be. I especially loved the thin crispy skin, and the drumstick, which took my breath away. The vermont sharp cheddar cheese waffles, on the other hand, were a tad disappointing - we could hardly detect the presence of cheese. I quite like the soft, doughy and lightly crisp texture of the waffles, though. The honey hot sauce and bourbon maple syrup are the perfect accompaniments to the dish, and so is the chilled spiced watermelon which everyone loves. However, $45 is really quite steep. 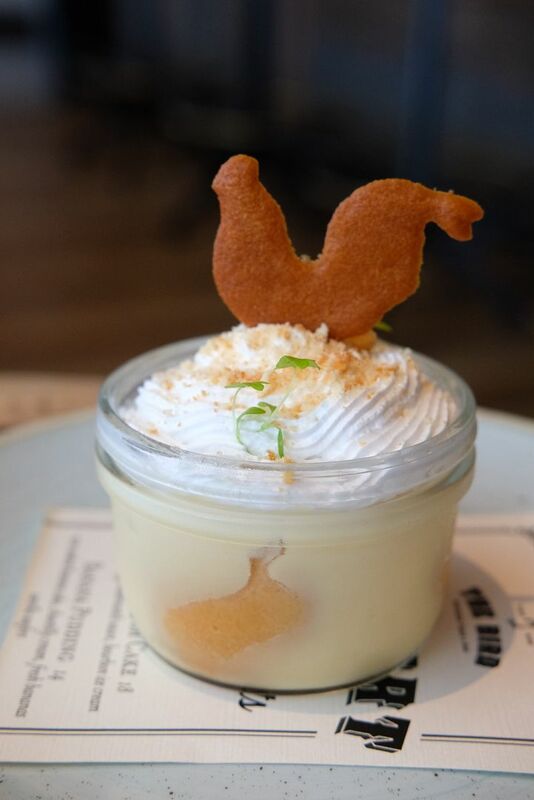 The Banana Pudding ($14) is the most popular dessert at The Bird. Vanilla wafer is embedded in rum-soaked banana cake and stuffed with fresh bananas, before the whole get-up is topped with mighty twirls of chantilly cream. 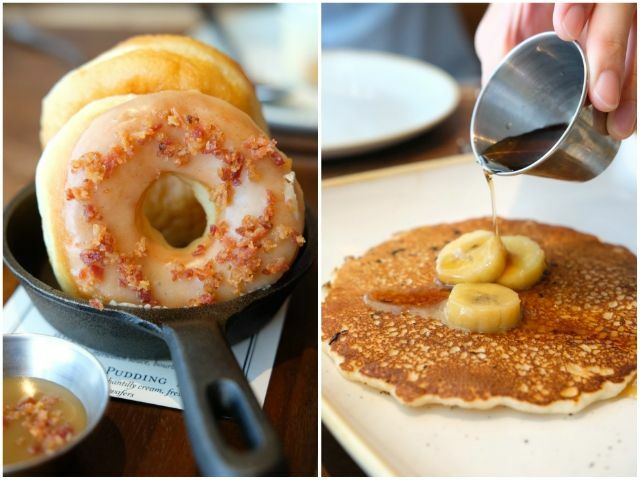 The Maple-glazed Donuts with Bacon typically comes in 4 rings, but we asked for a scaled-down version. We would have loved for the donuts to be fluffier and softer, but we quite enjoyed the warm butterscotch sauce that they came with. We also had the '77 Elvis Pancakes in a scaled-down version. The usual portion comes with three slices of thin old school pancakes studded with chocolate chips.The pancake were everything that we ever could have asked for. It was soft, moist, dense, and utterly gratifying. Drizzle some maple bourbon syrup over, slather on some peanut bacon butter and savour the pancakes together with the warm banana compote. 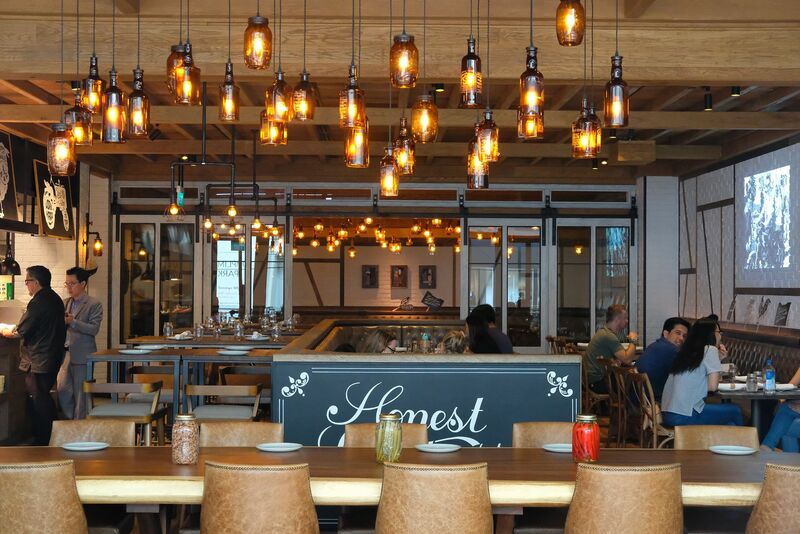 If you're seeking authentic Southern American cuisine, this is definitely the place to visit.